Predisposition - A starving, tired lion in a cage can be killed by kitty cats. Predisposition. Predisposition is to alter or preset conditions or position of a potential host in such a way that the likelihood of a successful attack by a potential pathogen is increased. An alteration of the environment of an organism in such a way that makes it an easy target for an available pathogen. The gun analogy helps. A gun must be loaded and cocked before the pull of the trigger will cause it to fire. The cocking and amount of explosive in the charge constitute the predisposition factors. 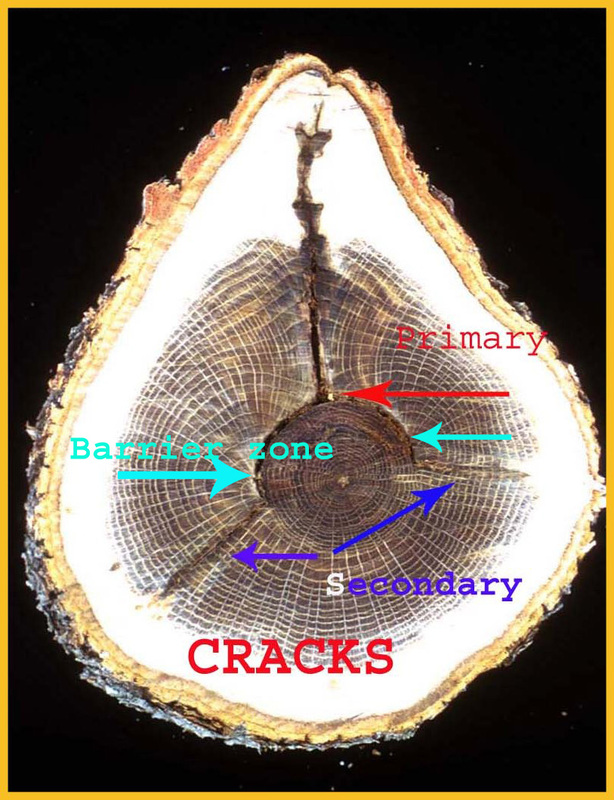 For example, a wound on a tree is followed by a barrier zone. A sudden decrease in temperature causes the wood to separate along the barrier zone. The decrease in temperature was constant at about a hundred trees, but only the tree with the wound and barrier zone cracked. Only the tree that was predisposed cracked. The cold pulled the trigger. The cold also pulled the trigger on the other trees, but they did not crack. A tree that is growing in poor soil, or with little water, will be predisposed to a number of pathogens. It is difficult to measure predisposition, yet it is a major part of disease. To fight pathogens and to not recognize predisposing factors will not help trees. More attention must be given to what keeps trees healthy rather than on "cures" for the sick. Athlete’s foot is caused by bacteria. Later the fungi come. If you treat only the secondary agent, the problem will not go away. Treating secondary agents associated with tree problems is legion. More on the topic. Also see a well written article Armillaria Root Rots, Predisposition and Poor Sorauer". In other words. Predisposition is a condition where survival cannot be maintained because of low defense. At this time, the clean-up crew infect or infest to utilize still available energy in the system. Decreasing energy reserves is a major cause of predisposition.